Left: Boeing tests parachutes for its Starliner spacecraft over Yuma, Arizona, on Feb. 22, 2018. Right: SpaceX tests Crew Dragon parachutes on March 4, 2018, over the Mojave Desert in Southern California, examining an abnormal situation in which just one of the two drogue chutes and three of the four main parachutes deployed. As NASA prepares to send astronauts to space in private space taxis, Boeing and SpaceX are running multiple parachute tests for the crucial re-entry phase. The tests are another milestone in the journey to start sending astronauts to space from American soil again; since the end of the space shuttle program in 2011, NASA's astronauts have used Russian Soyuz spacecraft launching from Kazakhstan to reach the International Space Station. SpaceX, which received $2.6 billion from NASA in 2014 for the current phase of the Commercial Crew Program, completed its 14th overall parachute test for its crewed version of the Dragon spacecraft on March 4. 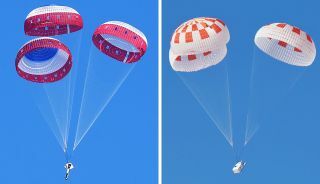 The test demonstrated how the parachutes would work during an abnormal descent, NASA officials said in a statement; another test is planned in the coming weeks. Boeing did its first reliability test in February to simulate a parachute landing with its CST-100 Starliner. The company, which garnered $4.6 billion from NASA in 2014, is performing reliability and parachute tests this year to ready Starliner for spaceflight. "We test the parachutes at many different conditions for nominal entry, ascent abort conditions including a pad abort, and for contingencies, so that we know the chutes can safely deploy in flight and handle the loads," Mark Biesack, a lead NASA engineer at Kennedy Space Center who oversees parachute testing for the agency's Commercial Crew Program, said in the statement. For SpaceX's parachute test in early March, a Lockheed Martin C-130 aircraft lofted a test vehicle that is supposed to demonstrate the same maximum speeds that SpaceX's Dragon spacecraft would experience during re-entry. The aircraft dropped the vehicle from 25,000 feet (7,600 meters) in altitude over the Mojave Desert in Southern California. "The test demonstrated an off-nominal, or abnormal, situation, deploying only one of the two drogue chutes and intentionally skipping a deployment stage on one of the four main parachutes, proving a safe landing in such a contingency scenario," NASA officials said in the statement. The next drop test will also skip a drogue parachute and main parachute, but in a different configuration, the agency added. Boeing's test flight in February used a long, dart-shaped test vehicle that a C-17 aircraft released over Yuma, Arizona, starting a series of reliability tests. Boeing plans to use the dart module twice more for testing. After that, the company will use a high-fidelity capsule simulator that is supposed to be a replica of the Starliner's shape and mass, according to the statement. This simulator will fly to 30,000 feet (9,100 m) in altitude under a large, helium-filled balloon before being released. The tests will examine parachute deployments and system performance. "In both the dart and capsule simulator tests, the test spacecraft are released at various altitudes to test the parachute system at different deployment speeds, aerodynamic loads and/or weight demands," NASA officials said in the statement. "Data collected from each test is fed into computer models to more accurately predict parachute performance and to verify consistency from test to test." Boeing's third of five parachute system qualification tests will take place in May, using the same balloon that is performing the reliability tests. In May, the balloon will loft a full-size version of the Starliner spacecraft to an altitude of 40,000 feet (12,200 m). The Starliner will then drop to the New Mexico desert, testing the deployment of three pilot chutes, two drogue chutes and three main chutes for a safe landing. SpaceX and Boeing plan to wrap up the parachute qualification testing by this fall. Separately, NASA's Orion program, which is intended to send astronauts to the moon or far out into the solar system, is also nearing the end of its parachute testing for the spacecraft. The testing for Orion has, in some cases, reduced the need for the commercial companies to do their own developmental parachute tests, NASA officials said. "The partners are making great strides in testing their respective parachute systems, and the data they are collecting during every test is critical to demonstrating that their systems work as designed," Kathy Lueders, Commercial Crew Program manager at Kennedy Space Center, said in the statement.